Huawei Technologies Co. Ltd has announced its flagship smartphone, which is due for a launch in the next month. This multinational company was established in 1987 by Ren Zhengfei. Initially this company had been manufacturing phone switches but presently it has expanded its business to telecommunications services, providing consultation services and many more. This new model with its high-end features is sure to attract the interests of numerous. But this model will be available in the high-priced range as it will be having many attractive features to compete with other premium flagship smartphones of 2017. The Huawei Mate 10 has a 6.0 inches screen and has IPS-NEO LCD display type. This model weighs around 139 grams. The device type is Phablet and the screen resolution for this model is about 2560 x 1440 pixels with a pixel density about 401ppi and color reproduction for about 16M colors. The screen to body percentage ratio for this model is about 72.4%. This model has a Gorilla Glass 5 over it and has dual front cameras as well as dual rear cameras. It has a fingerprint sensor on the rear panel just below the camera. The volume and power buttons are on the right edge. It will have a dual-SIM slot. It will be available in three colors white, black and gold. The Huawei Mate 10 has a faster 64-bit Octa-core processor which will help customers to work on multiple applications without any slowdown and lag issues. It has a CPU supported by 1.4GHz Cortex-A75 and Kirin 970 processor and its GPU is supported by Mali71MP8. Its operating system will be working on Android’s latest version 7.0 (Nougat). Its internal memory is about 64GB and can be expanded upto 128GB. The phone will have a 6GB ram that will allow the applications to work faster and provide customers with a great performance without any problem. This model has dual rear cameras as well as dual front cameras. For the rear cameras, one camera lens is 20MP and the other lens is about 12MP and for the front cameras, both the lenses are 8MP each. The features for the primary camera lenses include phase detection, digital zooming and laser autofocus. For the rear cameras there is a flash placed beside it which will sharp and clear images even in a lowlight background, while there is no front flash available for it but, while one front camera is for taking normal selfies while the other camera is wide-angle viewing. The video recording features for this model is also very good as it captures video in HD quality for owners to have a clear viewing of the video recordings they will take. The front cameras will also provide with better viewing while talking during a video call. The multimedia features for this model includes a 3.5mm headphone jack, it has speakers and also a FM Radio. It supports MP3 music player and MPEG4 and 3GP video player. The Huawei Mate 10 has a non-removable Li-Ion battery with 4000mAh battery that will last for long hours before it goes out of charge and put to charging again. This model has a quick charging option. It will support 2G, 3G and 4G network SIM cards and it also supports 4G VoLTE. EDGE and GPRS will be available in it. Some of the other features included are Wi-Fi 802.11 a/b/g/nac, dual-band, Wi-Fi hotspot, Bluetooth v4.2, A-GPS, GLONASS, accelerometer and proximity sensor. It will support HTML5 for browser. The Huawei Mate 10 will be a high-priced model because of the high-end features that will be available in it. But this model has its own advantages and disadvantages, let us briefly go through those features. It can connect to 4G LTE conforming to VoLTE networks. It has support of 3G HSPA/UMTS and 2G EDGE/GPRS cellular networks. Apart from that, the phone can connect to wireless networks compliant to IEEE 802.11 a/b/g/n/ ac networks. The phone will have support of dual Nano card slots. The battery will come with 4000 mAh capacity and a non-removable Li-ion type. The device will launch with latest Android v8.0 Oreo pre-installed with company’s own EMUI v5.0 mounted on the top. Yes. it will receive OTA updates. Will it support fast-charging technology? Yes, It will come with Huawei’s Super charge 3.0 rapid charging tech. It will have dual rear camera setup with a main lens of 16MP sensor + 23 MP sensor and, front cameras features a 12MP + 8MP sensor. Will it feature a fingerprint-sensor? Yes, it will have a fingerprint sensor for fast-unlocking that is present on the back side of the phone. Which processor will it power by? The processor of Mate 10 will be powered by Huawei’s new Kirin 970 SoC. As per the image leaks in press render, it is expected that the device comes in 3 colour options i.e Black, Blue and Brown. What is the expected release date of Huawei Mate 10? The company has officially revealed launch date of October 16 and said there will be announcement of new Mate 10 Series. It is expected that smartphones would be Mate 10, Mate 10 Pro and, Mate 10 Lite as per the leaked. Coming to display, it will have a 6.1-inch screen with an aspect ratio of 18:9. It would come with new “EntireView” edge-to-edge QHD AMOLED display with a resolution of 2880 by 1440 pixels. How much the device will cost? The official prices are yet to come. 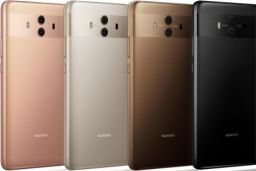 The prices would be announced in an upcoming launch event, but according to recent rumors it is expected Huawei Mate 10 price in Dubai could be around 4000 AED.